Marozzo’s footwork diagram, known as a Segno del Passeggiare. For for information on it, see Ilkka Hartikainen’s article titled The Segno del Passeggiare in Marozzo. Coda lunga will be when the sword is held outside of your right side, and it is divided into two different guards, one of which is called coda lunga stretta, and the other alta. 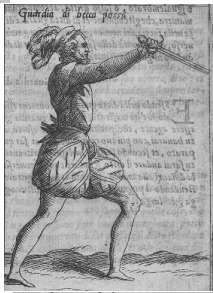 Coda lunga stretta is that which is done with the right foot forward, and coda lunga alta with the left foot, always holding the sword outside of the right side with the arm will extended and near the knee on the outside, and with the point aimed at the enemy. This is named so on account of its similarity to great men, who are perpetually accompanied by many people, and hence one hears the common proverb, “beware of those who have the long tail”, that is, that have a following. And likewise one needs to beware of this guard, because it has the long tail. Here are some illustrations of Coda Lunga from Marozzo’s manual. Note that Marozzo and dall’Agocchie may differ in minor details. For example, Marozzo’s Coda Lunga Alta is sometimes held higher that that of dall’Agocchie. 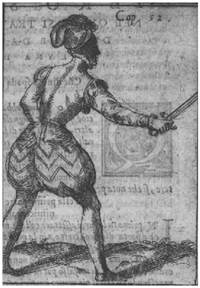 Regarding the high guards, the first is called guardia d’alicorno, and is recognized when the handle is turned entirely down, and the arm is well extended, and the point somewhat low, which is aimed at the face or breast of the enemy, in a manner similar to the unicorn, which, being attacked, fights in that manner with its horn. […]These four guards can be done in two ways, namely with either the right or the left foot forward. 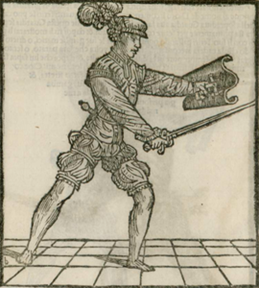 Marozzo refers to this posture as Becca Cesa (Weak Baldric) and Becca Possa (Strong Baldric), the latter being with the left foot forward. 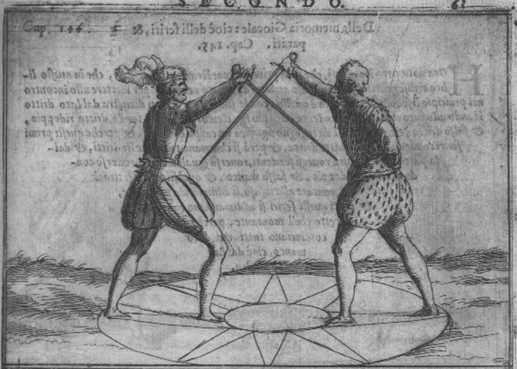 The second is called guardia di testa, which is when one holds the arm well extended toward the enemy’s face, and the sword on the diagonal, that is, so that its point goes toward your left side, and somewhat towards the ground, and it is called that because it protects the upper parts. Marozzo’s Guardia di Testa is different. However, Marozzo does illustrate dall’Agocchie’s version in the Segno del Passeggiare above. Also consider the German analogies by Hans Talhoffer, taking note of how it is used as a parry. While dall’Agocchie does mention Alta as a guard, he doesn’t like it and lists it among the guards he doesn’t plan on covering in depth. None the less, it is useful for describing a place through which many cuts must pass. 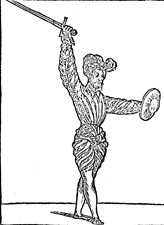 The first is called guardia alta and is seen when the handle of the sword faces upward with the arm well extended, and the point is turned toward the rear, and this is named on account of being the highest one that can be formed. The second is called porta di ferro, owing to its similarity to an iron gate, which takes a lot of effort and skill to batter down. Just so, to wound someone positioned in this guard requires skill and wit. This is similarly divided into two types, the one called porta di ferro and the other cinghiale. The first porta di ferro is when you have the right foot forward and the sword, with your fist, aimed at the enemy. 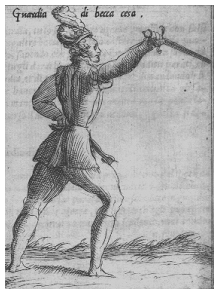 But cinghiale porta di ferro is when you have the left foot forward and on the diagonal, that is, toward your left side, and the sword hand near the left knee on the inside; and the right shoulder facing the enemy. It is named thus by comparison with the boar, or wild pig as we say, which, when it is attacked, approaches with its tusks on the diagonal in order to wound. Again, Marozzo’s version of these postures is sufficiently different that we are omitting his illustration to avoid confusion. Start in Coda Lunga Alta, that is with the left foot forward, with the point aimed at your opponent’s chest or face. Rotate the arm at the shoulder such that you form Guardia d’alicorno. The point must continue to be aimed at the opponent’s chest or face. Allow the point to drop into Guardia di Testa, keeping the hand high. Begin the back swing that brings your sword into Alta. As the sword passes through Alta and begins to move forward, step such that your right foot lands at the same time your blow would have struck. Work slowly at first to ensure that you are actually passing through each of the five guards. While there are several steps in this technique, your goal is to be able to perform them all as one continuous action. Both the agent (first fencer to move) and the patient start in Coda Lunga Alta. The agent will perform the cut as described in exercise 1. 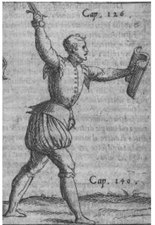 As the agent passes through Alta, the patient will step diagonally outwards with his right foot, protecting his head with Guardia di Testa as shown in the Talhoffer illustrations. To further increase his safety, the patient may rotate the back foot behind the front. Take care to not step so far that the rear foot crosses the front. See the Segno del Passeggiare above for an example of what this should look like. Repeat exercise 2. After the parry, the patient fencer shall allow the agent’s blade to slide off. He then cuts his own Mandritto (i.e. a cut from right to left) at the Agent’s head or arm. 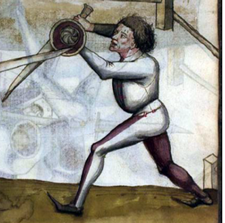 For longsword, we focused on Meyer’s Example Device. Refinement: Do note that the second Zwerch must be steeply rising such that it strikes the right arm rather than the head. This is not only harder to parry, it sets us up for the slice on the arm that occurs next. 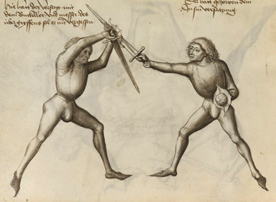 This entry was posted in Giovanni dall’Agocchie, Longsword, Meyer's Longsword, Sword Alone. Bookmark the permalink.